Sitting on the train back to University at the beginning of January, I decided to spend the time getting my brain back into gear for more complex mathematics, so I went on the App Store in search of some mental arithmetic puzzles. Alas, the quality of what was there was abysmal! Some games asked the same questions over and over again, whilst others thought the easy-to-use, beautiful, familiar keyboard built into iOS wasn’t good enough for their App and so came up with their own version with smaller touch targets and in one case reverse ordering of the buttons. 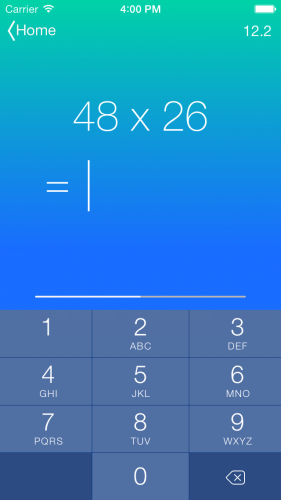 That evening, I gave Alastair a call and we discussed the possibility of creating a simple, easy to use, and most importantly, fun, app for people to practise their mental arithmetic on (initially, their times tables). Total Tables does just this. 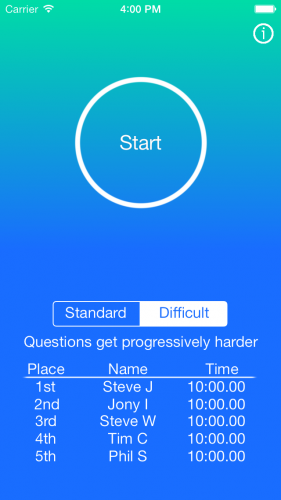 With a Standard Mode, featuring games of 10 randomly generated questions up to 12×12, players can race anyone around the world for the crown of ‘Fastest Time Table Guru’, and with the Difficult Mode, players can practise their mental long multiplication technique with 10 questions that get progressively harder up until 100×100. Total Tables is designed to be highly educational, great for the brain, fantastic fun to play and extremely competitive. Turtle Tables is our version for Kids. Want your Son or Daughter to get ahead with their times tables at School, or want to teach them long multiplication in advance? 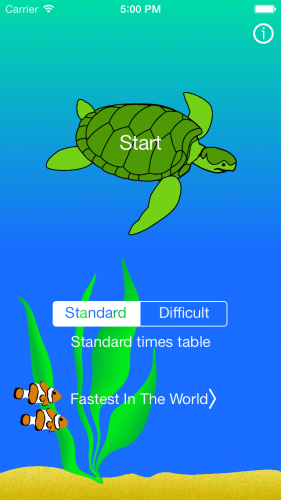 Download Turtle Tables, and they can have the same experience as with Total, with the addition of some wonderful, playful, animated sea creatures. Determining what Total Tables should be was incredibly difficult. How many levels of difficulty should we have? How should we support both children and adults? How could we encourage competitiveness, whilst focussing laser-like on the goal of education? Steve Jobs said that “Innovation is saying no to 1,000 things”. We may only have said no to a few hundred things, but to say no to just one more thing would have been to change the essence and ideal of Total Tables. We truly believe that there is not a single detail in Total Tables that doesn’t need to be there, not a single detail that draws your attention away from the content, and that every detail we included enhances the sense of connection between the user and the questions. After months of evenings work and a lot of going back to notes I took during my Human Computer Interaction course, we think Total Tables encompasses everything necessary and no more, for a great experience whilst learning and practising your times tables. We hope you enjoy using it, and we look forward to creating future versions testing other types of mental arithmetic based on our current design. Both Total Tables and Turtle Tables can be downloaded from the App Store by either searching their names or by using these links: Total Tables and Turtle Tables. 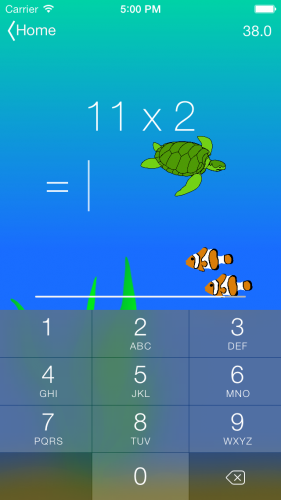 This entry was posted in Apps, Computer Science and tagged app, ios, iPhone, ipod, kids, multiplication, store, tables, times, total, turtle on December 9, 2013 by Sam. The reason most people go to WWDC is for the technical sessions – as a developer it is invaluable been able to learn from the people that made both the developer tools and the API’s that millions of people use daily. Again, because of NDA, I can’t go into details about the sessions, but I can talk about what I got out of them. Excluding the session on Tuesday night that I talked about before, and the WWDC Bash on Thursday night, there are four solid days of sessions and labs, taking part Tuesday to Thursday. The sessions are largely continuations from previous years – they will either continue on from their previous series (sometimes dating back 5+ years) on an API (of course, the past videos are all online) or start from scratch (if the API is new, or occasionally just because they think more people should use it). They run in any of the numerous massive rooms in the Moscone center, and sessions are usually run by the head developer of a module. Often they teach you by showing bad code practise and how it affects the user experience (or backend) and then show you coding techniques or just design techniques to improve the UI or program efficiency. Because of the nature of the presenters, they tend to spray information like a fire hose sprays water, but they are good presenters with a good sense of humour, and what with collaborative note taking it’s not too hard to follow (and remember) what they say. When I started learning Objective-C, I didn’t know programming theory (i.e. I knew very few data structures, and I didn’t know complexity theory and how to program efficiently). This meant that, like many self-taught programmers, I didn’t learn the best habits. I used WWDC this year as an opportunity to learn how to apply what I learnt in TPOP to Objective-C, as well as to get up-to-date on the latest design principles, code styles and Xcode versions (which is constantly evolving to include new time/code saving features). With iOS 7, 1,500 new API’s were introduced. No-one is expected to have used even a fraction of the preexisting ones, but this update you an idea of the vastness of Objective-C for iOS. I took it upon myself to get to grips with customisation of UITableView, as well as two other API’s new in iOS 7, both of which are going to have a significant effect on modern iOS apps. Thank you to the Computer Science Department at the University of York for helping me attend the conference – I learnt a colossal amount from it. This entry was posted in Apps, WWDC, York University CS Student Blogs and tagged apple, developer, ios, objective-c, technical sessions, wwdc, Xcode on June 18, 2013 by Sam. My time management skills are practically non-existent, and so I picked up an awful lot from Randy Pausch’s lecture. Nothing more so though than the benefits of a ‘To Do’ list. I knew that I needed to find a really good service that would sync between all my devices and was super easy to use. Over the last week, I’ve tried quite a few and read many reviews, and I think I have found the best one for the job. Wunderlist is a free service by ’6wunderkinder’, and is managed by a 10-strong team in Berlin. Their software syncs ‘To Do’ lists between iPhone, iPad, Android, Windows and OS X, which covers pretty much everything. In addition, when you open the app you are taken straight to the view showing your current list of jobs and at the top is the box to enter a new job. Could it be any simpler? I hope you find it as useful as I have! This entry was posted in Computer Science, University and tagged Android, app, do, ios, iPad, iPhone, list, management, pausch, program, randy, time, to, todo, useful, Windows on November 8, 2012 by Sam.